What has the State Department done to protect sites? These include emergency response to the looting of the Iraq National Museum, training of Iraqi museum professionals, support for archaeological site protection, and instituting legal measures to mitigate illicit trafficking in Iraq’s looted cultural property. Since 2003, several million dollars have been applied to these needs resulting in professional and infrastructure improvements to the National Museum as well as other museums and institutions, and improved archaeological site security in Iraq. As usual, the issue of site protection was lumped together with others, leaving it unclear how much money has been applied to supporting archaeological site protection, for what programs, protecting how many sites, with what results. Addressing the problem? Not exactly. • The Department of State is funding the newly announced Iraq Cultural Heritage Project (ICHP) and the development of a site management plan for Babylon. Together, these initiatives include programs that will focus on, inter alia, building Iraqi professional capacity for conservation, for preservation of sites including archaeological sites, and for museum governance and administration. It is expected that strengthening the ability of responsible entities within the Iraqi government and its citizens to serve as the responsible stewards of their rich heritage will have a positive impact on site and museum security on a sustainable basis. • In April 2008, the Department of Homeland Security promulgated U.S. import restrictions on all Iraqi cultural property after a decision to do so was made by the Department of State acting under authority delegated by the President. This import restriction is in addition to the ongoing OFAC regulations banning importation of Iraqi cultural property since 1990. • The Department of State supported two security assessments of the National Museum in Baghdad which resulted in $1 m. in contracts to implement security measures at the Museum. • In 2004, in response to evidence of serious looting of archaeological sites in southern Iraq, the State Department used funds donated by the Packard Humanities Institute to purchase 20 trucks and communications equipment for site guards in Dhi, Qar, Diwanyah, and Babil provinces. It was determined that these guards needed such tools to monitor the sites and deter the pillage that was being carried out by very well equipped looters. These vehicles and equipment were given to the Iraq State Board of Antiquities and Heritage (SBAH) which in turn issued them to the provinces for use by the site guards. According to SBAH officials in the affected provinces, this resulted in a substantial diminution of the looting in those provinces. • U.S. personnel responsible for the Ministry of Culture during the period of the Coalition Provisional Authority until July 2004 worked closely with the SBAH and with the Department of State to build and train a Facilities Protection Service (FPS) Archaeological Site Protection Force devoted to site protection under the administration of SBAH. 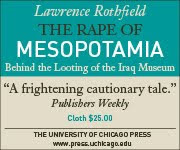 • Throughout the past several years the Department has acted to address the problem of looting in other ways such as promoting coordination within the international law enforcement community and funding the development, publication and distribution of the Red List for Iraqi Antiquities at Risk which is produced by the International Council of Museums in Arabic, English and French. Now in its third printing, this publication helps raise awareness about the problem among law enforcement entities and would be collectors. The US Embassy in Baghdad recently distributed new copies of the Red List throughout the country and in particular at border crossings. • The State Department has funded satellite imagery acquisition for large areas of Iraq to allow archaeolgists at SUNY Stony Brook to assess site looting. The Department has also funded training programs in satellite imagery analysis for Iraqi archaeologists. This list says volumes about the failure of American policy to deal with the problem of site looting. Import restrictions, Red Lists, site management programs, and security efforts at the Iraq Museum do not secure archaeological sites. The funding for trucks by the Packard Foundation in 2004 was never supplemented by any governmental assistance, nor was any effort made to solicit additional support from other foundations. The FPS force was never given the funding and logistical support it needed, and I believe it has now been disbanded. The funding for satellite imagery was not for large areas of Iraq, but only for southern Iraq, and was provided only in part by the State Department; given that the US military certainly has time-series satellite images available for all sites, it remains puzzling why the State Department did not arrange for those images to be provided to archaeologists, rather than paying for a private company to provide images for only a fraction of sites (and not in a coherent time series even for those sites). Only the last two of these bullet points deal directly with contemporary site-protection efforts. Most welcome is the news that a working group on site protection has finally been proposed and allocated funding for meetings. It would have been even more welcome if the working group included some experts on securing and protecting sites (not archaeological sites but all kinds of sites) from the military or State Department. The final bullet point raises interesting questions of its own. A similar helicopter tour of eight sites was conducted in June 2008, leaked almost immediately, and published in mid-July. Why is it taking so long to release the findings from the helicopter overflight in July? Could it be because they would contradict the message that both the US and the Iraqi governments want to present, that the looting is over? One hopes not, and it is always possible that the “expert participants” (presumably John Russell and Diane Siebrandt, neither of whom to my knowledge is an expert at analyzing imagery though both are highly competent, dedicated, and indeed heroic individuals putting their lives on the line in Iraq) simply are better at keeping things under wraps than the British Museum, but the delay certainly raises suspicions. As I have been somewhat disdainful of the initiative begun several years ago by Laurie Rush and others to raise cultural awareness within the military, I wanted to take this opportunity to report that this initiative has progressed dramatically since the original project to create decks of playing cards. The working group has coordinated effectively with the State Department and has established a process for the military to consult when they recognize that a proposed project may be affecting an archaeological project. This process recently saved Tell Arba'ah Kabiir, where Diane Siebrandt was able to arrange a meeting between Iraqi subject matter experts and representatives of the Army during the expansion of a patrol base. The proposed expansion was redesigned and the site was saved. We also had a working group member serve as a de facto cultural resource manager at Warrior Base Kirkuk. Mr. Pinckney, an Airman and a professional archaeologist was able to review and monitor construction projects. He also helped develop an illustrated construction check list for military engineers. The CENTCOM working group secured funding to bring military staff members to the upcoming AIA meeting. The Central Command Working Group established an ancillary GIS working group. Since the January meeting, with cooperation of AIA colleagues,we have been able to bring 3000 sites into the Army Central Command and Air Force Central Command environmental data bases for Iraq. We are now hoping for a similar accomplishment for Afghanistan. There are 20 additional countries where the Commands could benefit from similar information. -Central Command brought the heritage issue to the Eagle Resolve military exercises in Abu Dhabi as the lead topic at the Environmental focus group. -We have translated the Soldier pocket cards into three languages and are getting ready to distribute them. -The National Guard printed an additional 50,000 decks of the Iraq/Afghanistan playing cards and distributed them. -With support from Laura Childs and the AIA Southwest Texas Archaeological Society, Dr. Rush went to San Antonio where she briefed six military agencies about the importance of heritage training. The week long visit has established an excellent network with a series of potential partner agencies like the Defense Language Institute. -We have established an effective partnership with Air University. Staff there are going to include heritage property training in their cultural awareness modules. -The US DoD Legacy program funded travel to a symposium at the World Archaeology Congress where Laurie Rush, Paul Green, Jim Zeidler, Cori Wegener, Joris Kila, Friedrich Schipper, and Darrell Pinckney all gave papers. Matthew Bogdanos was the discussant. We also used the opportunity to have an international military archaeologist meeting where we talked about international opportunities to train military personnel as coalition partners and to share materials. Two edited volumes are planned as a result of the symposium, one on Ethics and one on training military personnel about archaeology and heritage issues. This is an extraordinary list of accomplishments, for which all involved deserve the thanks of anyone who cares about the protection of archaeological heritage in time of armed conflict (at least where that conflict involves the US). The only caveat here is that all of these efforts focus on protecting sites from the harm that can be done to them by US military actions (particularly engineering projects). The much larger problem posed by the failure to protect archaeological sites and museums from looting is not on the radar screen. Not sure what to make of the announcement below. On the one hand, it is good news that the Iraqis are going to provide a police commando force to help provide security for sites. On the other hand, there is no indication of whether this force is intended to simply substitute for the US forces that are withdrawing from areas that happened to contain sites, or whether the force will replace the recently disbanded Iraqi site police force. One thing is for certain: the AP's way of framing the story leaves the false impression that the United States has until now been honoring its responsibilities to secure sites beyond the limited number around its bases. BAGHDAD (AP) -- Iraq's national police chief has outlined new security plans for protecting the country's Central Bank, ancient sites and other landmarks. The announcement comes as Iraqis prepare to take over more security responsibilities under a recently approved pact with the United States. The National Police commander says hundreds of officers will be assigned to guard the Central Bank in Baghdad. A police commando force will also work up security for Iraqi archaeological sites and antiquities. A similar agency will protect diplomatic missions and embassies, which will eventually include the U.S. Embassy.